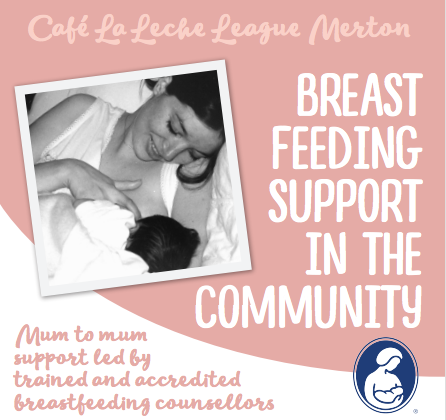 A very warm welcome to Café La Leche Merton! We are a breastfeeding support group for pregnant mums, breastfeeding mothers, babies, and toddlers. We offer support once a month on a Tuesdays 10.00-12.00 at: Hillside Church, 37 Worple Road, SW19 4JZ. No parking available but you can park on the Roads and pay and display. ​We are only meeting once a month at the moment so please check dates on our website. Our mother-to-mother breastfeeding support meetings will help answer your general breastfeeding questions over a cup of tea and included we have a drop-in service where you can come and speak to one of our Accredited Breastfeeding Counsellors. Do bring your red book if you can. We do not offer home visits at the moment, so please try and attend our meetings. We having been providing support in the community for the past 9 consecutive years and we are part of a larger international organisation called La Leche League International that began in America over 50 years ago! LLL Leaders are mums who have enjoyed nursing their babies and who have received extensive training as Breastfeeding Counsellors. Our accredited LLL Leaders are fluent in French and Spanish. "La Leche" means simply Milk in Spanish. What is La Leche League’s mission ? La Leche League GB’s mission is to help mothers to breastfeed through mother-to-mother support, encouragement, information and education, and to promote a better understanding of breastfeeding as an important element in the healthy development of the baby and the mother. Your baby has a tongue tie and needs help with position and attachment (we are not insured to do tongue tie assessments, but if you live in Merton you can ask your Health Visitor to refer you to the NHS Breastfeeding Specialist clinic at Acacia Children' center). La Leche League is an international, nonprofit, nonsectarian organisation dedicated to providing support, encouragement, information, and education to women who want to breastfeed. LLLGB is a registered charity affiliated to la Leche League International - the world’s largest source of breastfeeding information.